Digital curation tool Stoirfy is shutting down. The service will no longer be available after May 16, 2018. Storify became a go-to tool for journalists when it launched in 2011, allowing them to combine the best of user-generated content on the internet with reporting in dynamic, embeddable formats. 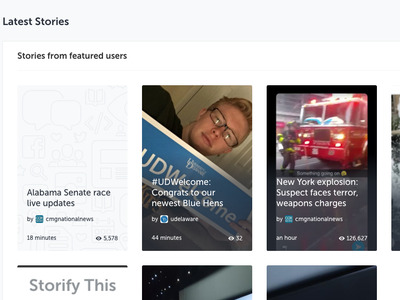 Storify, the digital tool that lets users string together stories and timelines using social media platforms such as Facebook and Twitter, is shutting down. According to the FAQ page on Storify’s website, the service will no longer be available after May 16, 2018. After that date, Storify.com accounts and content on the service will no longer be accessible. Existing Storify customers can continue to use the service until May 16, 2018, barring the ability to create new stories which will end on May 1, 2018. New users, however, can no longer create accounts on Storify. When it launched to the public in 2011, Storify was heralded as a dynamic innovation in the world of digital publishing. It became a go-to tool for journalists, allowing them to combine the best of user-generated content on the internet with reporting in dynamic, embeddable formats. Using APIs from platforms like Twitter and Facebook, Storify allowed users to drag and drop social media posts and links from a panel into a story window. Users could then choose to incorporate their own text around these posts. It also allowed users to cull and add content from Google searches, RSS feeds and YouTube. At its peak, the service was used by media companies including the Washington Post and HuffPost among others, and also attracted investments from the likes of entities like Khosla Ventures. In 2013, it was acquired by real-time commenting and curation platform Livefyre, which itself was acquired by Adobe last year, in a bid to expand its Experience Manager feature, a content management service for building web sites and mobile apps. Users who still want to access a version of Storify can do so by purchasing a Livefyre licence, which they can use to access Storify 2.